LMS Chairman: Loftus: Pius XII wanted liturgical abuses. Really? Loftus: Pius XII wanted liturgical abuses. Really? Strangely Mgr Basil Loftus' grinning face in The Catholic Times is still captioned 'Mgr Basil Loftus'. Hasn't the editor heard that Basil regards titles such as Monsignor as detestable flummeries? When can we look forward to seeing 'Mgr Basil Loftus'? The Tabernacle is firmly fixed to the Altar at Our Lady of Willesden, just as Pius XII wanted. Today (30th June edition) he makes the argument that the even the most extreme and illicit liturgical excesses of today are in continuity with the liturgical movement, as represented by Fr Pius Parsch and as endorsed by Pope Pius XII. Pope Pius XII put the icing on the liturgical cake when he told the all-important Internationla Congress of Pastoral Liturgy meeting in Assisi in 1955, that "the liturgical movement is a sign of the providential disposition of God for the present time as well as of the Holy Spirit in the Church." Loftus is quoting selectively. In his allocution to the Assisi conference (in 1956), Pope Pius XII gave some stern warnings against the very excesses which Loftus is arguing he approved. 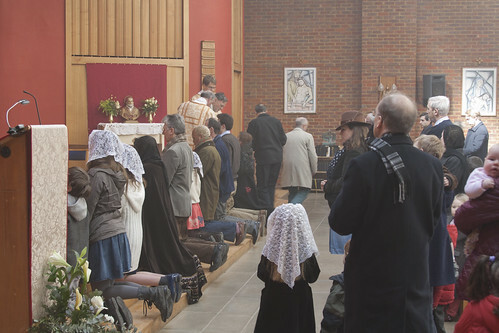 To give just one example, the practice of Mass 'facing the people' was making an appearance in the mid 1950s. What does Pope Pius say about this, in this allocution? It is one and the same Lord who is immolated on the altar and honoured in the tabernacle, and who pours out his blessings from the tabernacle. 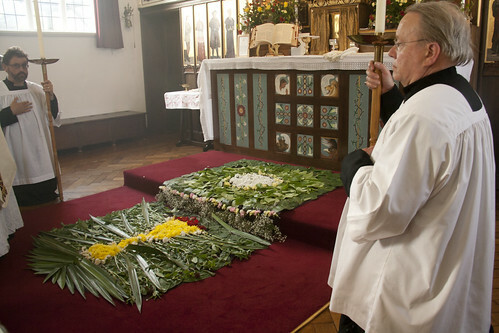 The Tabernacle ajar during Communion at SS Gregory & Augustine's, Oxford: Loftus hates the practice of taking hosts for Communion from the Tabernacle, a practice which emphasises that it is 'the same Lord' in the tabernacle, as Pius XII said. If the Altar is fixed to the tabernacle, it is obviously impossible for the priest to celebrate Mass from the far side of it. Did Pius XII approve of celebration versus populum? No he did not: he argued against it, he legislated against it. How could he make it any clearer? The tensions within the Liturgical Movement, and the role of Pius XII, and also St Pius X and John XXIII, to reign in what was wrong with it, are steadfastly ignored by Mgr Loftus, who wants to present us with a single 'organic' development. It is clear, therefore, that the post-conciliar implementation and further specification of the liturgical reform was not only mandated by Vatican II but was an organic continuation of a movement which Pius XII had enthusiastically backed for some 15 years before the Council even began. The whole of the post-conciliar liturgical reform of the Mass and sacraments, as well as of the breviary, is the true hermeneutic of continuity in reform. Both the Council and the post-conciliar implementations were no more or less than the fuller ripening of a fruit which had been maturing for 15 years before the Council and was then ready to be picked and enjoyed. I think that last bit must be about not making a scene when people want to receive communion on the tongue. How can there be 'continuity' between John XXIII's insistence on the importance of Latin in 1962 (in Veterum Sapientia), and Vatican II saying 'Latin must be preserved' in 1963, on the one hand, and the villification of Latin promoted by Loftus? How can attempts to bring Latin back be in 'rupture' with the Council, and what went before it, which explicitly demanded that it be preserved? [151.] Only out of true necessity is there to be recourse to the assistance of extraordinary ministers in the celebration of the Liturgy. Such recourse is not intended for the sake of a fuller participation of the laity but rather, by its very nature, is supplementary and provisional. A modern chapel with the traditional Tabernacle / Altar arrangement: at the Oratory School. I've written more about the difference between what the Council mandated and what was actually implemented here. But Loftus is not content with what was actually implemented officially - the legislation and official texts. He is talking here of liturgical abuses - practices which have been repeatedly condemned by the Church - or the wickedness of Papal initiatives such as the new translation of the Ordinary Form. This is all quite dotty and harmless but for the fact that he is actually attacking his fellow priests: priests who are merely following the Church's liturgical laws, or are allowing the people to exercise their right to receive Communion kneeling and on the tongue. This is not harmless: it is serious. The madness of these articles has got to stop. 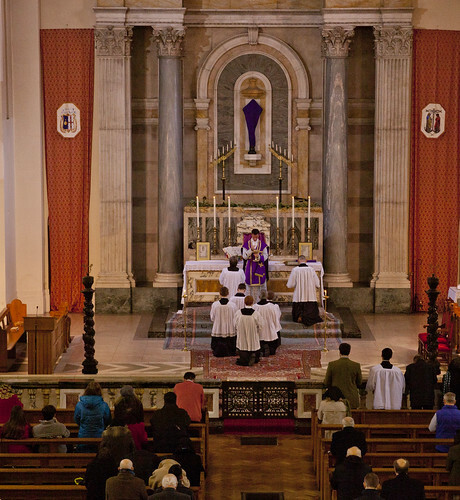 Communion of the Faithful: 'in a united and adult manner'. Many thanks for refuting Basil Loftus. BUT... I am beginning to wonder if you are not giving him what he obviously desires....the oxygen of publicity? Just a thought! Well you can always make that argument. But I think it is weak in this case because he claims a certain prestige and expertise, and these claims are implicitly supported by a national Catholic newspaper. He has an influential platform. Not to dispute his arguments is to let them go forth into the world unhindered I fear. When can we see Basil Loftus without his title? Better still when can we expect not to see him at all ? 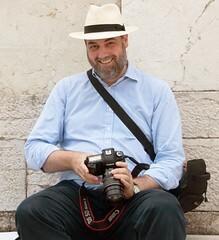 Until he has gone the newspaper he writes for should also think about dropping the title "catholic". In the meantime Mr.Shaw keep up the good work. I don't think it's a detestable flummery to refer to the blogger as Dr Shaw. I was intrigued that Dr Shaw should twice draw our attention to Pope John XIII [965-972], until I realised that he was one X short of a 20th century Pope! Phrasing this as carefully as possible: does Mgr Loftus genuinely not understand what Popes and the Council said, or is he genuinely tergiversating to state a new and anti-Catholic position? Assuming that he is "genuine" I find it hard to see how he could be anywhere between either of the two extremes. In the meantime, I think we have to add The Catholic Times and The Universe - the two horses in that particular stable - to The Tablet as occasions of sin to be avoided. It was Joe Kelly that led me to blogging! On this point Mgr. Loftus is quite correct. Pius did absolutely nothing to stop versus populum celebrations - when he could easily have done so. The selective quoting seems to apply to others than Mgr. Loftus in this case. You can't deny Sanctissimam Eucharistiam came out under Pius XII! Even if you think he should have done more. No one is denying anything. My point is that you are being as selective in your quoting and interpretation as Mgr. Loftus if not more. Let's look at each stage properly. Firstly, what did Pacelli actually say in his address to the delegates of the Assisi Congress? Did he tell them Mass could not be celebrated facing the people (it would have been rather odd if he had done so as many of the Congress Masses were indeed versus populum as they had been at the earlier, smaller, gatherings at Maria Laach, St. Odile and Lugano in the early 1950s). Page references refer to the address as given in ‘The Assisi Papers’, The Liturgical Press, Collegville, 1957. So, at Assisi, Pius does not say the practice is either an abuse [I would disagree with him on that one for the record] neither does he say that the practice is forbidden. Indeed he say the question of how tabernacles can be placed so that Mass can be celebrated versus populum admits of several solutions which shall be clarified. Sometime ago I blogged about such an arrangement in an American re-ordered sanctuary of the 1950s. I'll comment on the next point, what Sanctissiman Eucharistiam actually said and the commentary by the experts who produced it tomorrow. Thanks, this is interesting. I confess I haven't seen the full text of the address. I'll get this book if I can. My reference to abuses however is not to Mass vs. populum, which is obviously permitted today in the OF and in some churches always. Loftus' argument of 'continuity' between Assisi in 1955, insofar as it was officially approved, and what is *still* against the rules, is what I am concerned with. The abuses of today would horrify Pius XII, and indeed the Council Fathers. Nb what was winked at as an experiment at a conference is not the same as what was approved for everyone officially. Apologies for being a day late, I fear I was melting yesterday. I think you are missing the valid point Mgr. Loftus is making, or trying to make, that the whole process of litugical reform in the twentieth century was a 'hermeneutic of continuity' to coin a phrase. I don't think that there was any winking at conferences either to be honest. What would horrify Pius XII is the idea of resistance to reforms promulgated by the papacy. Anyway, back to the 1957 decree. Here is an extract from J.B. O'Connell's commentary on it that appeared in the, conservative, periodical 'Clergy Review'. O'Connell was, famously, the reviser of Fortescue's 'Ceremonies'. ‘§4 is entirely a new law. 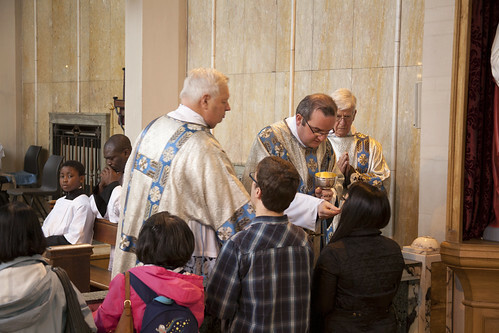 To celebrate Mass facing the people is per se lawful and provision is made for it in the Ritus Celebrandi Missam (V, 3; XII, 2), but as the practice has been obsolete, except in a few churches, mostly in Rome, for many centuries it may not now be introduced without the permission of the Ordinary of the diocese. 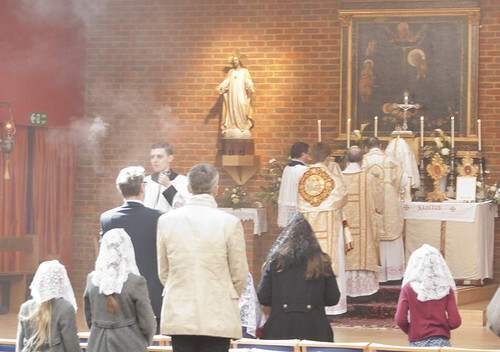 One great difficulty about it in practice is that if a tabernacle is on the altar it will, to some extent at least, prevent the actions of the celebrant being seen by the congregation, and this is what is desired by those striving to get the people to take a more active part in Mass. Accordingly, those who advocate a return to the early practice of celebrating facing the people, want the tabernacle either removed from the high altar or made as small and inconspicuous as possible. The new rule is directed against this. 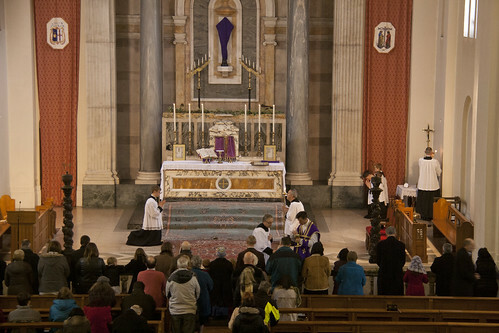 Where there is only one altar in the church it must not be so built that Mass facing the people can be celebrated on it; and on this one altar, in the middle, a proper tabernace, “in form and size fully worthy of such a great Sacrament” must be placed. 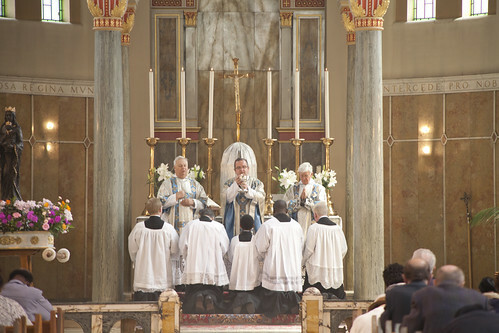 As so Mass facing the people may now be celebrated only on an altar where there is no tabernacle (and therefore, normally, not on the high altar) – it could be a temporary altar erected for a special occasion – or on one where there is a tabernacle fully in conformity with the rubrics. [My emphasis] Such a tabernacle need not, however, be an enormous one – for this would prevent it being fully veiled by a coenopaeum – and so need not prevent much of what the priest does at the altar, especially the actions that concern the congregation, being duly visible. 'The Care of the Blessed Sacrament' in 'Clergy Review', Vol. XLIII (1958), pp. 11 - 18. Quote from pp. 15-16. I will make additional comments, from more radical periodicals of the period, tomorrow or next week. Yes, 'The Assisi Papers' is worth reading. More useful still, as an anthology, R. Kevin Seasoltz, 'The New Liturgy - 1903 -1965', Herder and Herder, 1966. A clue in the title for the observant there!